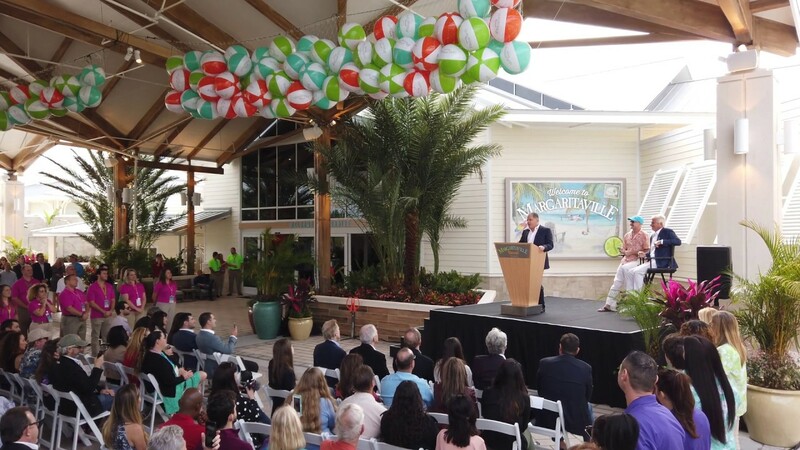 Jan 23, 2019 in "Margaritaville Resort Orlando"
Earlier today, the brand new $800 million Margaritaville Resort Orlando officially opened its doors and welcomed guests to the latest resort destination in Central Florida. Located just a few minutes away from Disney's Animal Kingdom along Route 192, the resort destination spans over 300-acres and includes four main components: Margaritaville Hotel, Margaritaville Cottages, Sunset Walk shopping, dining and entertainment district and Island H2O Live! Waterpark. The centerprice of the resort is the 184 room hotel, with rates beginning at $199 per night. An inviting main lobby features floor-to-ceiling views of the lagoon pools, the sounds of the tropics, and even a welcome cocktail. Island style continues in the guest rooms, which feature a cool and tranquil color palette with pops of color. Each room includes plush white bedding, a flat-screen TV, a coffee-maker, a mini-bar and a workstation. Suites are also available, including the 2,500 sq. ft. Jimmy Buffett Suite, which includes its own private kitchen and sprawling terrace on the top floor. All rooms have balconies that overlook Fins Up Beach Club, which all hotel guests have access to, including its beach entry lagoon pools. The resort also offers shuttle transportation to all area theme parks, including Walt Disney World. On Vacation Cafe - This casual eatery serves breakfast, lunch, and dinner inspired by Florida and international cuisines and flavors. Provisions - This fast-casual restaurant provides various grab-and-go bites. With eight treatment rooms, a sauna, steam room and salt room, St. Somewhere Spa is the spot to relax and rejuvenate the mind, body, and soul. The open-air promenade comprises almost 200,000 square feet of retail space, including Studio Movie Grill, a dine-in theater with 12 screens and more than 1,000 luxury recliners; and Rock & Brews, a craft brewery that will book live concerts and will be opened by former KISS bandmates Gene Simmons and Paul Stanley. Other tenants at Sunset Walk: Avalon Day Spa, Bahama Bucks, BurgerFi, Capone’s, Cold Stone Creamery, Ford’s Garage, GameTime and Sketchers. Opening Spring 2019, Island H2O Live! will feature 20 slides and experiences, including a lazy river, a wave pool, a kids’ area, and a river raft ride for the whole family. Designed to enable guests to customize their experience and share it with the world, the park uses a new RFID wristband system that will enable guests to personalize the music and lighting they experience on select rides, making every time very unique. The wristband system at Island H20 Live! is called Vantage and is the latest offering from water slide manufacturer WhiteWater West. The Vantage system works through an app that guests download either before or when they arrive. Once they arrive at the park, guests sync the app to their wristbands. A scanner on certain slides will read their wristband and automatically play songs and lighting effects from the previously established selections. The app also allows guests to earn loyalty points with every ride. Guests can win prizes such as free food and beverage items, skip-the-line passes, and more. Both Annual Passes and Single Day Passes will be available for admission. The second phase of homes to be built in the island-inspired vacation cottage neighborhood is Paradise Cay. Recently selling all homes in Sunset Cove neighborhood, Paradise Cay will include187 custom cottages located on Margaritaville’s 300-acre resort. Homes will start from the low $300,000. Click the gallery for more pictures of our tour around the new Margaritaville Resort Orlando. To make hotel or cottage reservations for stays beginning January 2019, visit www.MargaritavilleResortOrlando.com or call 855-995-9099. For information on purchasing a vacation cottage, call 407-702-9067.